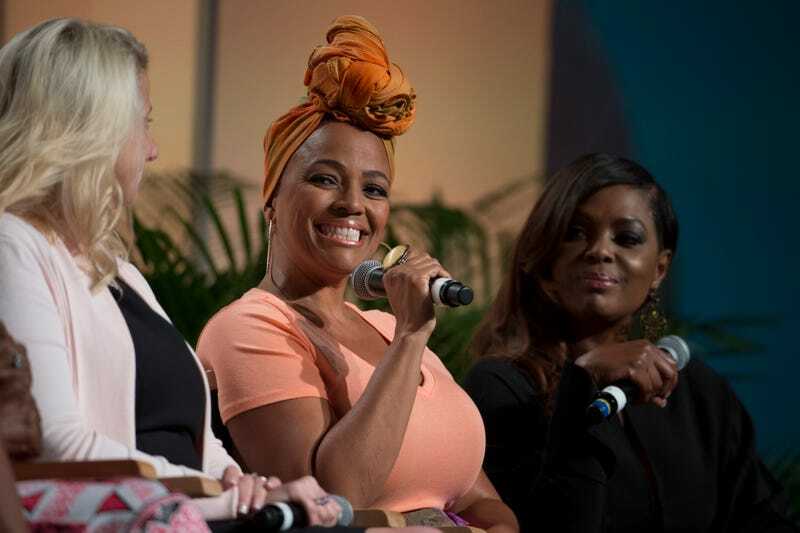 Growing up on the television screen, notable moments of actress and director Kim Fields’ career are linked to several classic sitcoms, from Good Times to Diff’rent Strokes. Since stepping into the public eye in a 1976 Mrs. Butterworth’s commercial, and her sitcom debut on the short-lived Baby, I’m Back in 1978, Fields has built a career grounded in her deep love for her craft. Her most celebrated television roles are as Dorothy “Tootie” Ramsey on NBC’s The Facts of Life (1979-1988) and Regine Hunter on Fox’s Living Single (1993-1998). In her new memoir, Blessed Life: My Surprising Journey of Joy, Tears, and Tales From Harlem to Hollywood, Fields, 48, opens up about the highs and lows in her life and career. Reflecting on her longevity and growth in the industry, including her avoidance of the “child-star curse,” the New York native and mother of two wanted to bring light to the woman behind the beloved characters of her fans’ childhood. “At this point, celebrating 40 years in the industry, it felt very much like a milestone. Not at all that I’m ready to be done, but just a ‘Let’s look back on some things, and let’s talk about some things that we haven’t talked about.’ So, it felt like a time to look at God’s highlight reel when it comes to me,” Fields says. As the daughter of actress and television director Chip Fields (who played the abusive mother Penny Gordon on Good Times), Fields credits her mother’s advice as one of her sources of direction. Whether encouraging or simply straightforward (“Have a backup plan. You might not always be a cute kid that can do one-liners”), she took her mother’s words to heart during her hiatus to attend Pepperdine University as a teen before venturing back to acting in the early 1990s. Fields has stepped behind the camera, directing and producing television shows and movies, even appearing on The Real Housewives of Atlanta and Dancing With the Stars. Currently, she has a development deal for a TV movie drama with Lifetime network, has created a line of coffee with her husband, Christopher Morgan, and will be starring in the second season of the British comedy Living the Dream. The Root talked to Fields about Living Single, her career ambitions and more. I had one person on social media who told me that they learned so much about themselves reading this book. I think one of the biggest compliments though is people who know me have said, “I thought I knew you,” or “I didn’t know this about you,” or “I still learn something about you”—and my manager who’s known me for decades says that. Those are the touching things when people have told me that because of my transparency in dealing with really difficult and challenging times in my life that they have connected or reconnected in a different way, spiritually, in their faith. There are times we try to act like, oh, we’re in our 30s and 40s and we’ve conquered insecurity, or we’re comfortable in our skin. That’s a crock. You might have that an hour a month, and the rest of the time, you’re actually working on that along with everything else. Whenever I have a big meeting, a red carpet, and I’m feeling a little insecure and not as confident and as comfortable in my own skin, I remember my mom saying, “Don’t let anything or anyone intimidate you, including yourself.” Most of the time it’s not from external forces, it’s an energy that we’re putting in ourselves that generates from us. We get in our own head, we get in our own way and then got the nerve to put it on other people. No, that’s you, boo-boo. There are tons of characters that are still inside of me that I haven’t done. There are tons of scripts and stories to tell, both as a director and an actor. For me, it just becomes, “What haven’t I done?” It’s still a long list; even though I’ve been blessed to be in the industry for a long time, many of those years were playing one character. My two series, that’s 14 years of comedy, so, being able to do drama is wonderful, like A Question of Faith. I would love to do sci-fi, I would love to do graphic novels, do more voice-overs, all sorts of things. It’s very surreal and an indescribable blessing. The chemistry that we had and the relationship that we had, and it’s still intact to this very day. We have a text thread between just the six of us. It’s just like we still work together. Then when Hulu announced that they were going to be streaming the show, the response to that! I thought they were going to break social media. I was so blown away. That’s why I’m always saying to the fans, “I love how you love us.” It feels fantastic. One of my favorite guest stars was Grant Hill. He was so hilarious. It was so unexpected with his humor. My finale is definitely one of my favorites: the proposal [from Dexter]. You know, I have none! [Laughter.] I have no idea, and only because [Living Single creator] Yvette Lee Bowser is so brilliant. I wouldn’t dream of trying to put into the universe where Regine would be and who she would be. I know she’s somewhere being fabulous. That much we all know; that’s part a no-brainer. Even if she’s completely unfabulous and her world is falling apart, in her mind, she’s still fabulous.